Our latest Employee of the Month is Zufan Almedom! 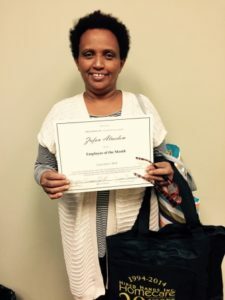 Zufan began working for Hired Hands Homecare in December of 2015. Zufan brings to the table years of CNA experience, a positive attitude and a willingness to jump in and help when needed. Thanks Zufan!! During our conversation, Becky told me that Zufan and the staff have been doing a wonderful job and Becky is glad we have her on their weekly team! Zufan, THANK YOU so much for your consistent dedication and commitment. You truly make a daily difference, and put smiles on seniors’ faces!